Eyelet and lace and peep-through panels and flounces. One of the best of this genre had been hiding out for a long time. So glad I nabbed it – and so pristine! As much as I love the old formals, this frock has a lot more versatility from day to night, though it probably could have gone to the Prom at some smaller school in it’s day. It would also make an interesting wedding dress. 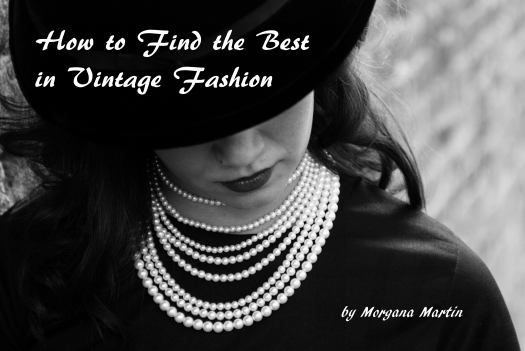 That’s what’s so much fun about vintage fashion finding (well, one of the things) – the ideas and possibilities are almost endless. No rules!! Both these little ladies were made in Hong Kong, of similar basic design, but there is a world of difference between them. Lady Left was made for the uptown market, while Lady Right was sold downtown. Though they’re both clean and well-put-together, Lady Left grew up with all the best, while Lady Right’s beginnings were more humble. It’s obvious “in person” that these bags were made for different markets. The styling in both is superior, but the materials and extra attention to detail show that Lady Left brought a higher price. I don’t have a favorite. Their stories are equally interesting to me (maybe Lady Right’s is a little more so . . . . .). Each one is perfect with the outfit that coordinates with it. While Lady Right could be much more casual, she is no less elegant – maybe even more so, if you don’t look too closely. Lady Left could seem a little tasteless if she showed up everywhere dressed like that. I see one for holiday festivities or a very gala occasion (maybe tonight? ), while the other would be lovely with a pretty summer dress. Both would be gorgeous for a bridal venue. It can all be so fascinating . . . . . . . . . . . .